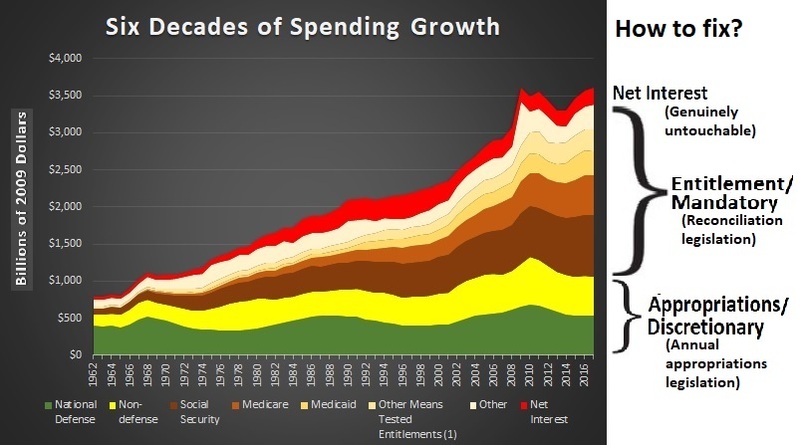 I write constantly (some would say incessantly and annoyingly) about entitlement spending. And I occasionally write about discretionary spending. If you’re pressed for time, you can stop reading now. You have the key information already. But if you want to get a bit wonky, here are two other charts that help explain the intricacies of how budgets work (or don’t work!) in Washington. The first thing to realize is that there are two budget processes in Washington. There are entitlement programs, which basically operate on autopilot. For all intents and purposes, the President and Congress could go on vacation for the next three years and programs such as Social Security, Medicare, Medicaid, and Obamacare would mechanically continue. 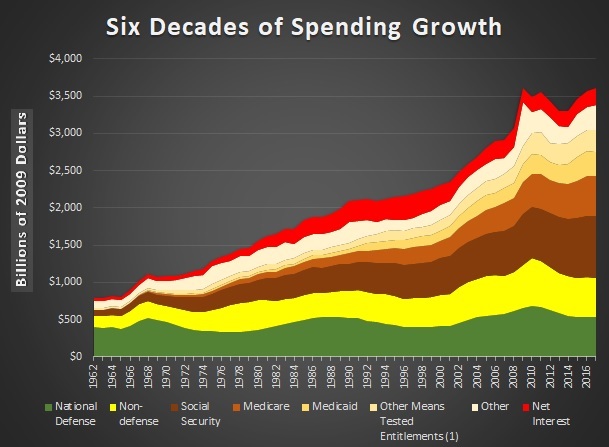 But there is also “discretionary” spending for the Pentagon and various domestic programs, all of which is determined through an annual “appropriations” process. Whenever you read about a government shutdown, it’s because politicians can’t agree on the level of funding for the discretionary part of the budget. Now let’s get to my favorite part, which is figuring out how to limit the size of the federal leviathan. This last chart shows that net interest spending is genuinely untouchable (unless one wants a Greek-style or Argentine-style default). The rest of the budget, however, can be addressed. Entitlements can be changed through “reconciliation”, which is a legislative process designed to minimize procedural roadblocks (in general, tax bills also use reconciliation legislation). And discretionary programs can be changed via annual appropriations legislation. 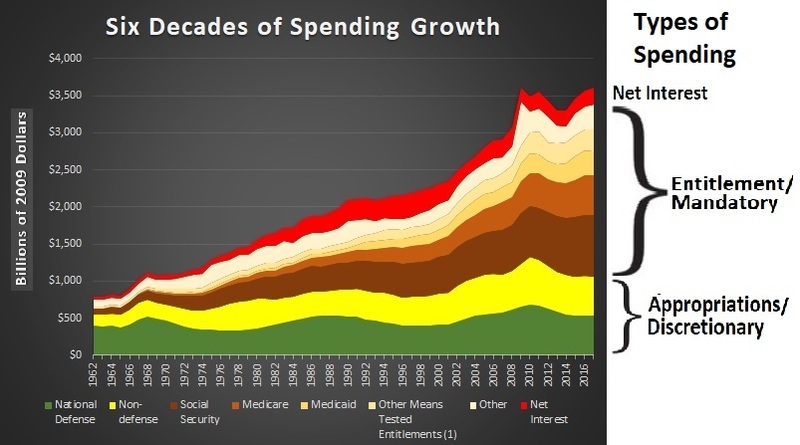 I should add that net interest may not be directly touchable, but interest payments can be reduced by controlling spending and thus reducing red ink. 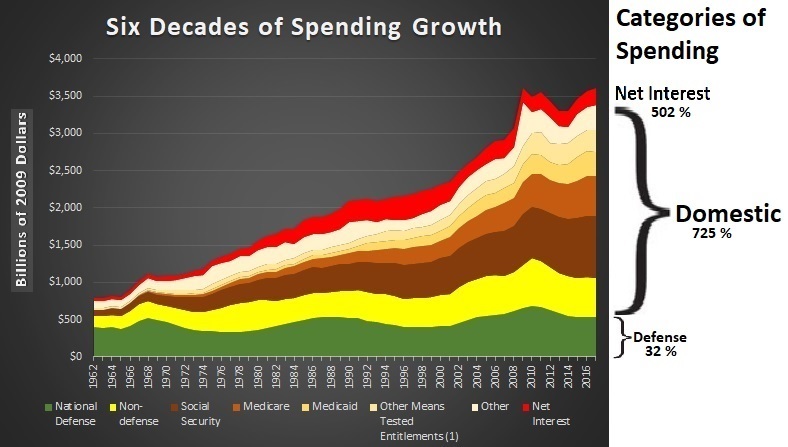 Another thing to understand is that the budget caps (yes, the ones that were weakened in 2013, 2015, and earlier this year) only apply to discretionary spending. 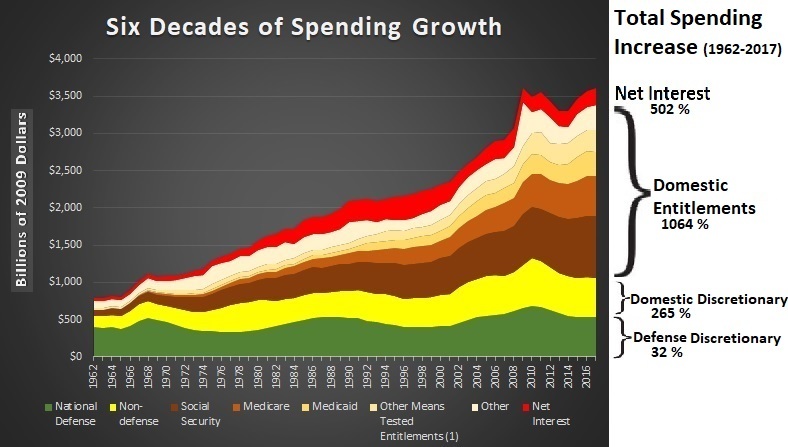 And the most important thing to realize is that the only solution to our budget mess is genuine entitlement reform. Which is why we need constitutional (and comprehensive) limits on total outlays. Politicians will only do what’s right if every other option is off the table.